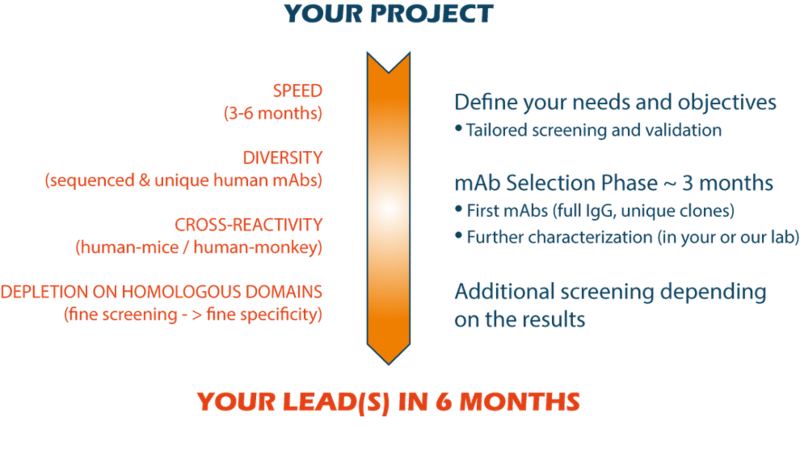 iMAb supplies human monoclonal antibody leads to biotechnology and pharmaceutical companies, with a view to their development and marketing for therapeutic or diagnostic applications. To that end, iMAb's mission is to generate antibody hits developed to match customer specifications and, at lead validation, to transfer the lead antibody sequence along with full ownership and exclusive rights for the customer to carry on its drug development. iMAb offers a wide range of services for highly tailored antibody selection and validation. We provide customers with customized antibody screening services using proprietary Humanized Synthetic Antibody Libraries (PMEW and HuscI) and highly innovative, flexible, and robust processes. This allows for the in vitro selection of stable antibodies recognizing your target antigen with high specificity, irrespective of its format or medium (protein, cell, peptide), and without the need to immunize animals. Antibody selection can be performed on specific cell surface antigens like GPCR's, or other membrane proteins, even when these are present at low copy numbers at the surface. 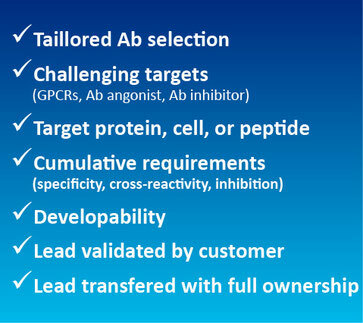 Owing to its flexibility, our system allows for cumulative customer requirements, combining multiple requests such as: target specificity, post-translational modification specificity, species cross reactivity (multi-species Fc’s can be easily fused to the antibody of interest), agonist, enzyme inhibitor, epitope-specific, post-translational modification specific... For these reasons, iMAb is perfectly fitted for challenging targets with a customer chain of requirements. As we are determined to transform the antibody hits we screen into a lead validated by customer, we verify antibody specificity for the application you request i.e ELISA or FACS and/or functional test, prior to sending the antibody hits to customer for lead validation. Because our objective is for the customer to carry on its drug development, we pay particular attention to developability for the hits and leads we provide.